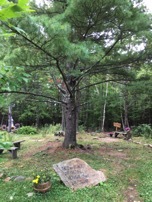 On a visit to the Peace Pagoda in Leverett Massachusetts last fall, I found this tree dedicated by Jake Swamp (Tree of Peace Society) in 1985. My friend, Dr Laurie Dohmen and I were on our way to Kripalu School of Ayurveda where this past year we attended three 10 day modules of a course in Foundations of Ayurveda and Ayurvedic Herbology. We had the honor of being the first veterinarians in the Kripalu course! Our fellow classmates went on to become Certified Ayurvedic Health Councilors and Laurie and I have gone on to continue our exploration of Ayurvedic Medicine and its herbs to help our animal patients and our veterinary herbal students. One lecture that we have enjoyed putting together for our herbal course is an overview of various cultural approaches to herbal medicine including Western (coming from the Greek origins of our modern day medicine), Ayurvedic Medicine from India and Traditional Chinese Medicine. Even though I am a Western herbalist, some of my favorite herbs come from Indian and Chinese traditions. Ashwagandha (Withania somnifora) and Astragalus (astragalus membranaceous) are two that I use everyday. After taking these courses in Ayurvedic medicine, we are better able to read Ayurvedic herbal descriptions (material medica) and have a deeper understanding of the skills used by our medical predecessors before we had so many technological diagnostic tools. It is amazing what they could do using well developed powers of observation. I appreciate the contributions of these ancestors as well as the modern tools and medicines we have today which combine into Integrative Medicine bringing the best of all worlds together. If you are interested in scheduling an herbal medicine consultation, please contact me! Research has shown that simply thinking about gratitude improves our outlook and health. (Click here for more) Building a daily habit of just asking yourself "What am I grateful for?" can improve your mental state whether you think of an answer or not! I wrote this poem last year to share the concept of gratitude with my veterinary herbal medicine students in the Outerbanks. 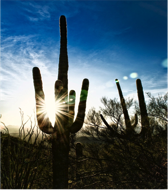 It was inspired by a nature meditation exercise used by the Wilderness Awareness School and the 8 Shields organization both founded by Jon Young, author of Coyote's Guide to Connecting with Nature. I use this poem to encourage my students to express their own gratitude, in their own words, to all that surrounds us in a regular (ideally daily) practice. It seems appropriate to share it now as I am reminded of all of the things I am grateful for. And for the water that flows over and inside the Earth and inside all living things. The fish, the insects, the birds, the mammals big and small, and the humans, who all give of themselves in their own way for us to live together on this Earth. I am grateful for the wind that brushes my face, the clouds in the sky, the thunder and lightning, the rain and snow that clean and water the Earth. I am grateful for the sun that warms my skin and gives us life, for the moon that tugs on us, the stars that inspire, the distant planets and the universe stretching out as far as the imagination can go and beyond. I am grateful for beginnings and endings, creators and destroyers, and again for the creators that bring us full circle to life. I encourage you to create your own thanksgiving address however small or grand every time you walk outside. As many of you know, my family and I have spent the last few years, and more intensively this past spring, caring for my father as he prepared for his last journey on this earth. It was an effort as well as an honor to walk with him as far as we could on our final physical goodbye. We continue to speak with him and say goodbyes as we think of him often. I am so grateful to have had the flexibility and support of my family, my friends and also my Harmony Housecalls patients and their loving families. Thank you so much for your kindness and understanding during this time. It is an incredibly cold day on the first of January in Iowa. It was -21 degrees Fahrenheit overnight and -13 for a high temperature today! It seemed like a good time to provide some reminders and resources on winter care for our animals. It is not the best day to stick to those New Year's Resolutions to walk the dog more. 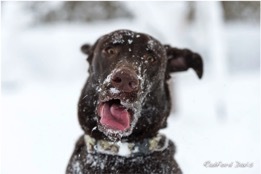 Our Labrador is dancing on the cold ground after just a few minutes to run out for a potty trip and he is usually very enthusiastic about the winter cold and snow! Remember that though their feet are much more tough than ours, the domestic animals that live in our homes may need some extra foot protection and/or limited time outdoors during these extreme conditions. Feet and belly fur should be rinsed after walking on salted roads and sidewalks as that can also cause irritation. Check pads for cracking or redness and watch for licking or limping. Limit time outdoors for those not adapted to the cold and even then, this is an unusually cold snap for us following unseasonably warm temperatures just a few weeks ago. "Normal" adaptations may not be in place for us or our animals! If you have any questions or concerns, feel free to contact me!